More millennials are renting now than were five years ago, but most of them still aspire to live in single-family, detached homes in the near future. Sound familiar? It should. Those are two of the main findings of an Urban Land Institute-commissioned survey of Americans of age 19 to 36 discussing their housing preferences and finances. The survey, to be released Wednesday, is the latest in a long line of assessments of millennials’ housing druthers. It’s a much studied topic that, nonetheless, doesn’t always yield consistent outlooks. The National Association of Home Builders in January released a survey finding that most millennial respondents intend to eventually purchase single-family homes in the suburbs. Conversely, the Nielsen Co. told us last year that millennials prefer to live in the city. Meanwhile, Commerce Department data show that, in 2014, more millennials moved to the suburbs from the city than vice versa. 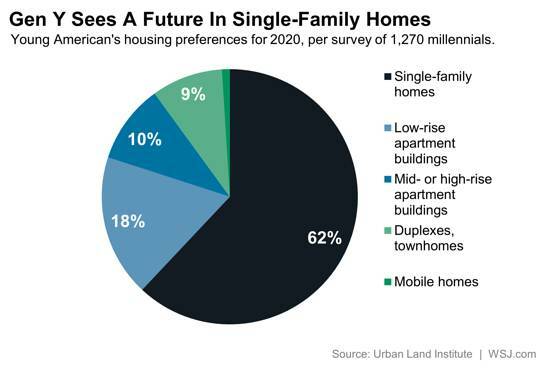 The avalanche of assessments and forecasts stems from the housing industry’s desperate need to know where and how young Americans will live and how soon they’ll do it. Millennials, loosely defined as people born in the 1980s and 1990s, are the largest customer segment since the baby boomers. At an estimated 75 million to 80 million, millennials account for a quarter of the U.S. population. The trouble for the housing industry is that millennials have abstained from buying a home for longer than previous generations did at their age. Homeownership among Americans 35 and younger registered 34.6% in the first quarter, down markedly from the peak of 43.6% in the second quarter of 2004. The relative dearth of home purchases by first-time and entry-level buyers has kept the home-construction rebound subdued and subsequently helped constrain the supply of existing homes for sale. Many economists, housing analysts and home builders foresee an inevitable reversal of that trend. They posit that millennials, also called Generation Y, will start buying homes and moving to the suburbs. Yet many forecasters just can’t say for certain if that will start in earnest this year, next or five years from now. That’s why surveys like the latest from the Urban Land Institute, or ULI, garner considerable attention. ULI is a global organization aimed at providing research and education for real-estate professionals such as developers, planners, architects and academics. The new ULI survey canvassed 1,270 millennials across the U.S. in November. It is the sequel to a similar survey that the group conducted in 2010, providing interesting comparisons between the two. The new ULI survey found that half of millennial respondents rent their homes. That’s up markedly from the results in 2010, when 37% of respondents were renters. In tandem, millennial homeownership declined; ULI’s latest survey found that 26% of respondents own their home, down from 35% in the 2010 survey. Millennials generally have encountered more hurdles en route to homeownership than previous generations, including strict mortgage-qualification standards, mounting student debt and, until the past year, weak job and wage growth. Meanwhile, they are waiting until later in life than did their elders to take steps that usually precede home ownership, such as getting married and having children. However, the ULI survey also found that millennials remain as resolute as in past years to eventually own their home. The latest ULI survey found that 70% of millennials anticipate owning a home by 2020. 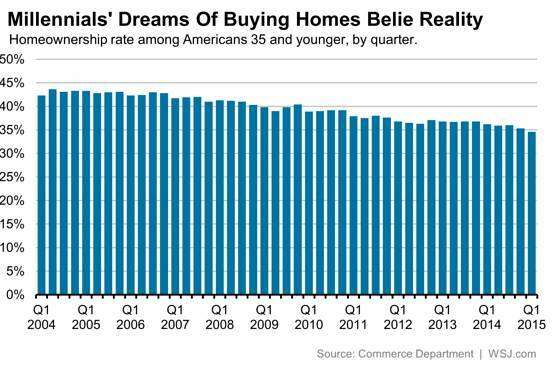 That’s a tad higher than the 67% who said in the 2010 survey that they foresaw being homeowners by 2015. “The Great Recession has not dimmed Generation Y’s preference for single-family homes, mostly detached,” wrote Leanne Lachman, the survey’s co-author, a real estate consultant and a Columbia Business School executive in residence, in a report outlining the survey’s findings. Alan Holmes, a 29-year-old television-advertising salesman and social-media marketer, currently rents a one-bedroom apartment close to downtown Atlanta. He said he prefers to live close to a light-rail stop so he can use mass transit to avoid traffic during his commute. He wants to remain in the center city, but he also wants a yard and more space. Curtis Witek, a 25-year-old living in Chicago and preparing to start work next month in Chicago Mayor Rahm Emanuel’s office as part of a fellowship program, lives just outside of Chicago’s Loop, its central business district. He is moving this month to a three-bedroom apartment with two roommates in a three-story complex in Chicago’s Noble Square neighborhood. Mr. Witek says one of his first considerations for any new home is whether it is within easy walking distance of a mass-transit stop. The latest ULI survey revealed other aspects of millennial housing preferences, some of which run counter to conventional assumptions. For example, while millennials are generally thought to favor mass transit and ride-sharing services, 83% of the survey’s respondents said they own a car. ULI itself long has championed dense, urban-style development with a mix of housing types and a focus on walkability rather than car-dependency. Yet ULI’s survey, like the 2010 version before it, found that well less than a fifth of millennials live in the exact places – downtowns – most often associated with urban density. Specifically, 13% of respondents reported that they live in downtowns, up from 12% in 2010. In contrast, 35% said that they live in “other city neighborhoods” outside of downtown but still in the central city and 15% said they live in “newer suburbs” outside of central cities. Some experts contend that the focus should be on the type of developments young Americans want to live in rather than whether they’re in downtowns, close-in neighborhoods or suburbs — definitions of which can vary greatly. Christopher Leinberger, a nonresident senior fellow at the Brookings Institution, said 13% of millennials living in downtowns is a much higher rate than for previous generations. Is This What Will Push Millennials Into the Housing Market?